The Esri Geoportal Server LiveDVD Demo 2013 runs on a fully functional openSUSE Linux operating system. 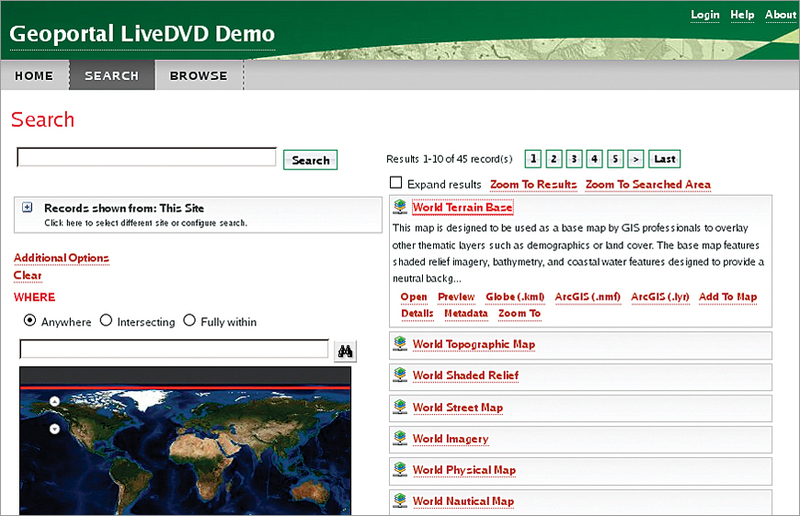 Esri has released a new version of the Esri Geoportal Server LiveDVD Demo. This LiveDVD Demo allows users to test out a live instance of Esri Geoportal Server without going through the installation and configuration process. Esri Geoportal Server is a free, open-source product that enables discovery and use of geospatial resources, including datasets, rasters, and web services. The LiveDVD Demo provides the perfect test environment to try out customizations of Geoportal Server before implementing them in a production environment. Geoportal is already installed and configured on its own self-contained Linux operating system. It can be booted directly by putting it in a computer’s DVD drive before turning on the system or booted up using a virtual machine. Either way, it does not touch the hard drive of the host computer. The LiveDVD Demo was built on the openSUSE Linux operating system via the SUSE Studio image creation tool. It is more stable than the previous version and features new functionality. It now supports several wireless network adapters and allows users to install the LiveDVD to their computer’s hard drive, giving them a permanent Esri Geoportal Server implementation. Digital and physical media versions of the Esri Geoportal Server LiveDVD Demo 2013 can be requested for free by visiting esri.com/geoportaldemo.